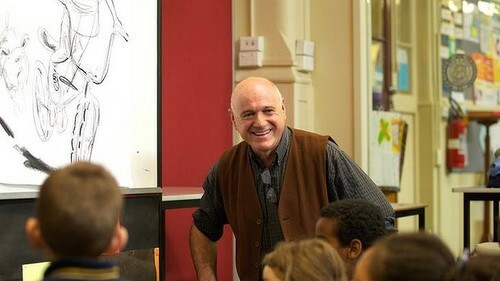 Over 40 years Craig has illustrated close to 400 books – picture books, junior novels and many readers – collaborating with many of Australia’s most experienced writers and editors. The writers include Doug MacLeod, Libby Gleeson, Sally Morgan, Duncan Ball, Emily Rodda, Gary Crew, Paul Jennings, Rachel Flynn and Nigel Gray… The books include Billy the Punk, Where’s Mum, Sister Madge’s Book of Nuns, Bob the Builder & the Elves, Emily Eyefinger (series), I Hate Fridays (series), Cabbage Patch Fib (series), Toocool (series), Going Bush With Grandpa (series). More recently The Windy Farm, The Unforgettable What’s His Name, Some Secrets Should Never Be Kept, Remarkably Rexy and I Was Only Nineteen. Craig’s talks are about books and pictures. …what authors, editors, and illustrators do …but the main focus is drawing! Where to begin? What to keep in mind? How to make choices? Plus tips for bringing characters to life with movement, expression, humour and drama. With LOTS of hands on learning-by-drawing. Craig’s presentations are about drawing. More particularly, his presentation is about the basic questions and choices for the illustrator when thinking about how to approach a text. To explore these questions, students are guided through a fun exercise – starting in a deliberately loose, rough, imprecise way – sketching the simple shapes first, thinking through the choices, and trying out imaginative – both dramatic and humorous – ideas. The tasks set are age appropriate from pre-school to senior. Every session is a bit different, but each is at least in part a workshop. Students will be drawing, and trying out pointers in a guided way within the session. Thus all students experience how an illustration begins to take shape. Several books and examples of finished illustration will be referenced in a session. One important teaching text is *Doctor Frankenstein’s Other Monster by Nigel Gray.